FAA partners with Tobacco Free Florida to support smoke-free policies. Smoke-free multifamily housing is in demand among Florida’s renters. In fact, more than 83 percent of adults in Florida do not smoke, and four out of five of them would prefer to live in smoke-free housing. 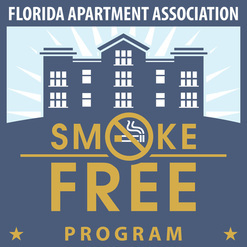 That’s why the Florida Apartment Association has partnered with the state Department of Health and Bureau of Tobacco Free Florida to provide resources for property owners and managers to adopt smoke-free policies. Informational presentations are held at local affiliates throughout the year, and FAA can connect your community with a Tobacco Free Florida representative in your area. But that’s not all. FAA believes providing a healthy environment for your residents and employees is worth bragging about and offers a certification to help your community do just that.